Yamaha F-310 Acoustic Guitar, Natural Finish. 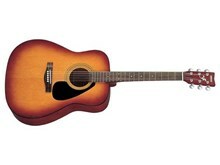 Yamaha's most popular guitar, the F-310 is a dreadnought acoustic with a laminated spruce top. Available in Natural, Cherry Sunburst or Tobacco Brown Sunburst.